Here's a quick quiz to test your scam-protection savvy: Imagine you're at home when your phone rings, and upon answering you hear a recorded voice saying that this call is from your local jail, and [mumbled incoherent syllable, or possibly a name you think you recognize] wants to call you collect. Is this really an incarcerated friend or relative of yours, or is it a scammer trying to trick you into running up false charges on your phone bill? Of all the various scams which my colleagues and I have detailed here at ConsumerAffairs, the “collect call from jail” scam might be the single most difficult for certain potential victims to guard against. This is because the scammers' mode of operation is so disturbingly identical to the real thing. Most modern phone-based scams are very easy to detect, so long as you memorize one or two simple rules. Take the “one-ring phone scam,” which is popular with a particular subset of phone scammers known as “crammers.” Crammers trick people into calling numbers with extremely high fees attached, by programming computers to call thousands of random phone numbers, ring once, and then immediately disconnect. If you return this call, you'll be connected to a high-priced chat line, “adult entertainment” line, or other pricey service located outside the country. But it's easy to avoid the one-ring scam with a simple rule: never return a call from an unfamiliar number that leaves no message. Remember and follow that one rule, and you'll never be snared by the one-ring scam. There's also a utility-company variant of this scam, where the scammers will threaten to shut off your electricity or other vital utilities within the hour for alleged unpaid bills. 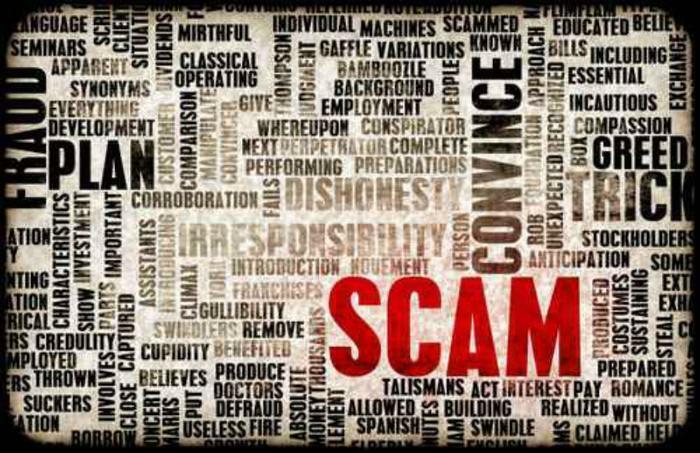 In all such scams, the easy rule to remember is that, even when these agencies do take punitive measures – such as the IRS going after tax scofflaws, or utility companies shutting off service for non-payment – they'll never, ever contact you over email or your phone. If you genuinely do owe back taxes, need to serve jury duty, or pay old utility bills, those notices will be addressed to you personally and arrive in the old-fashioned U.S. Mail – and they'll give you far more than an hour or so to resolve the problem. So, ignore any emails or phone calls threatening immediate consequences unless you make immediate payment, and you'll avoid that scam. But there's no similarly easy rule to avoid the collect call from prison scam, short of refusing to accept any collect calls from prison – which works fine if you don't actually know anybody there, but if you do have an incarcerated loved one, the scam version of the collect call from prison can sound disturbingly like the real thing. I used to receive and hang up on maybe one or two of these scam prison calls every month, but over the long Labor Day weekend the scammers upped the ante and robocalled me three times — I don't know if that was a coincidence, or if the scammers figured a long holiday weekend might somehow make people more likely to take their bait. If you receive one of these scammy calls, the version you hear will likely differ slightly from mine, depending where you live – actually, which prison complex or penal institution is nearest you. I'm currently in the northernmost part of northern Virginia, about an hour's drive from the city of Manassas, which gained fame during the Civil War for being where the First and Second Battles of Bull Run were fought. I moved here in the summer of 2012, and barely three days later somebody robocalled my new home number to say an inmate wished to call collect from some local jail. So I laughed and hung up without a second thought – I couldn't possibly have a friend in the local hoosegow, when I hadn't had time to make any local friends yet. I actually do know a guy named Mark. Several of them, in fact, including my colleague Mark Huffman. It's such a common name, almost everybody in America knows a guy named Mark – and the ones who don't likely know a Mike or two. That's probably why the scammers chose the name. The robocaller went on to invite me to press one for English, or dos para español. I ended the call instead. What exactly were the scammers trying to do here? What would've happened had I pressed any of the buttons the robocaller urged? I didn't make the experiment, but there are several possibilities. At least two variations of the collect-call-from-prison scam exist. In one version, the caller actually is an inmate from a local prison, trying to make phone calls at your expense. As early as 2009, the Better Business Bureau warned against this scam. “It's called custom forward calling and it basically links your number to the number that is being dialed from,” the BBB's Mechele Agbayani warned at the time. If you fall for this, inmates will be able to make future collect calls on your dime, rather than their friends' and families'. But it's unlikely any actual inmates were behind my robocalls from last weekend; real inmates would know the proper name of ther own prison. More likely, “my” scammer hoped to target somebody who actually does have an incarcerated loved one (or fears that they might); had I pressed any buttons, I either would've been connected to a high-cost premium line, similar to victims of the one-ring phone scam, or the scammers would've been able to make other collect or out-of-country calls and charge them to my account. You receive a call from an operator saying there is an inmate from a correctional facility who needs you to accept a collect call and the associated charges. Once you accept the call, the caller convinces you to hang up your phone, dial in *72 and another phone number. * 72 is the code used to forward your incoming calls to another number, if you have call forwarding service or if it's available on a per-use basis in your local exchange. If you do this, the inmate will then make additional collect calls to your number, but the calls will be forwarded to someone the inmate knows at the number where you forwarded the calls. That person accepts the charges, but they are billed to you. Often you don't realize this has happened until you notice your phone not ringing or you receive your bill with numerous unexpected charges. How to protect yourself: Never accept collect calls unless you are absolutely sure you know the person calling. Never activate call forwarding unless you need to do it for your own reasons and to a number you know. At least there's a simple, easy rule to protect yourself from *72 scams – never agree to activate this call-forwarding service. But if this were a custom-forwarding scam, or a prison-flavored version of the one-ring scam seeking to connect me to a premium-price phone line, I would've been caught the second I pressed a button on my phone keypad – long before anyone could ask me to press *72. And, of course, it's easy to avoid all forms of prison-call scam if you know none of your friends or relatives are currently incarcerated. But if you actually do have an incarcerated loved one, separating the real collect calls from the scam ones is much harder. After all, real prisoners can only talk to family members by making collect calls (which are usually extremely expensive for inmates' families, though extremely lucrative for whichever private phone company is lucky enough to snag a prison-calls contract). Genuine collect calls from prison usually appear as robocalls inviting you to press various buttons if you agree to accept the charges — just as the scam versions do. That's why there's no simple, easy, all-purpose rule to avoid being tricked by scam versions of the same calls: if its a scammer calling you, you dare not press any buttons on the phone keypad — but if it's a real loved one calling, then you have to. My scammer used the wrong name to identify the local jail, but such a mistake would be very easy for him to fix – and maybe the scammers in your area won't be as careless as the scammers in mine.